After a bad week for bike crashes, cyclists urged city officials to take action. Kristen Green and Siouxzi Donnelly speak at last Wednesday's MBAC meeting. The quarterly Mayor's Bicycle Advisory Council meeting is usually a tightly scheduled show-and-tell, with staff from the Chicago Department of Transportation and other city agencies giving presentations on what they're doing to improve cycling. But during the first week of September there was a rash of serious and fatal bike crashes in the region, and last Wednesday CDOT threw out the script and opened the floor for cyclists to voice their grief and rage. On the morning of Tuesday, September 4, 63-year-old Glenn Richmond struck an open car door in northwest suburban Arlington Heights and later died from his injuries. That afternoon in Logan Square, a teen driving a stolen car struck a female cyclist, 30, fracturing her vertebrae, scapula, and ribs. 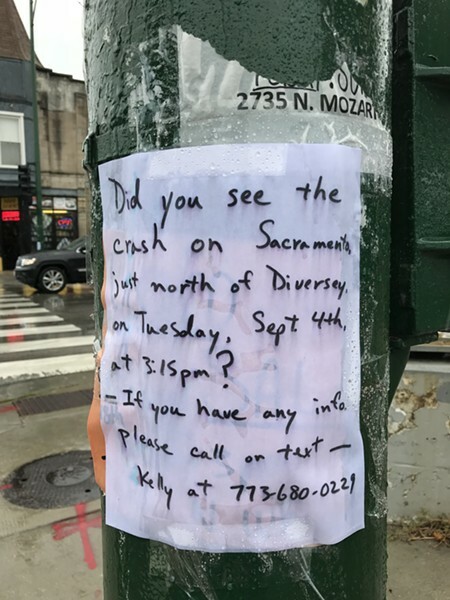 Flyer posted by Diversey and Sacramento in Logan Square, where the driver of a stolen vehicle seriously injured a female cyclist. In the early evening of Wednesday, September 5, a car passenger opened their door on architecture student Thomas Ferrer, 25, causing him to fall in the street. A SUV driver then ran over him, inflicting severe brain damage. And that Friday morning a motorist fatally struck 59-year-old Randy Ehlers on a bike in north-suburban Zion. 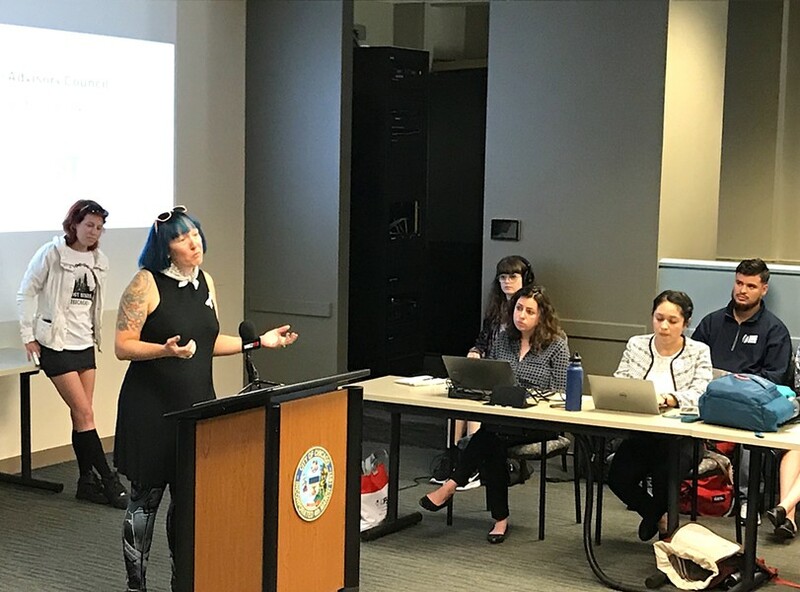 Shaken by the events, Kristen Green of Ghost Bikes Chicago reached out to ask CDOT for time at the MBAC meeting to discuss the hazards for cyclists that she views as a public health crisis. Ghost Bikes installs white-painted bicycles at crash sites to honor fallen cyclists, and Green has known more than her fair share of people killed in bike crashes. Blaine Klingenberg, a courier who was fatally struck by a bus driver at Oak and Michigan in June 2016, was a friend. Lisa Kuivinen, the 20-year-old Art Institute student who was struck and killed by a right-turning flatbed truck driver that August in River West, was an acquaintance. And Angela Park, 39, a Chicago Athletic Club spin instructor and triathlon coach who was fatally struck by another right-turning trucker last August in Greektown, was a customer at Wicker Park's Alliance Bakery, where Green works as a barista. At the start of last week's meeting, CDOT commissioner Rebekah Scheinfeld invited the capacity crowd to participate in a "productive conversation" on how to prevent more bloodshed. Green began the discussion. "I bring you a message from the families and friends," she said. "I'm surrounded by intelligent people in this room. We need to figure this out. No mother or father should have to say goodbye to their son or daughter." Souxzi Donnelly of Chicago Family Biking, a Facebook group with some 1,800 members, then took the podium, listing a number of areas where improvement is needed. After four bike riders were killed in the region in 2016 when they were crushed under the wheels of trucks, in July 2017 the City Council passed an ordinance requiring side guards and convex safety mirrors on all trucks of more than 10,000 pounds used for city contracts of more than $2 million. Side guards help block pedestrians and cyclists from falling under a vehicle, and they could have made a difference in the case of Angela Park, but the dump truck driver who struck her wasn't working for the city, hence wasn't required to have them. Chicago needs to close the loopholes in the law, Donnelly argued, noting that cities including New York, Boston, and London have stricter requirements. Donnelly added that another factor in Park's death was that the Madison/Halsted intersection where she was struck was bottlenecked by barriers for a construction site at the southeast corner, which meant that there was no safe place on the street for cyclists. She argued that in areas like the West Loop and 18th Street, where Thomas Ferrer was struck, bike routes are frequently disrupted by the many construction projects, so the city should better regulate development—or at least better enforce the rules. CDOT staffers then addressed some of the cyclists' concerns. Assistant commissioner Sean Wiedel said making side guards universal for large trucks operating in Chicago would require new state and/or federal regulations, and said his department is in preliminary talks on the subject with Illinois officials. Notably, in 2012 Active Trans pushed for state legislation requiring convex mirrors on all large trucks, but the Illinois Trucking Association successfully lobbied against the bill, so there could also be industry resistance to state side-guard regulations. Bike-focused lawyer Brendan Kevenides, who was at the meeting, later told me that crash cases he has handled involving construction sites suggest that it's rare contractors to make accommodations for cyclists: "There's a complete disconnect between what CDOT says is happening and what's actually happening." Nevertheless, after the meeting Kevenides and other attendees told me that this cathartic conversation about bike safety was worth having, because it reminded city officials of the real-life dangers cyclists face and urged them to take action to improve matters. Commissioner Scheinfeld seemed to agree. She thanked the cyclists for their "really valuable" input into Vision Zero, the city's current effort to eliminate all serious and fatal crashes by 2026. "The reason we're here is because we all care about these things," she said. "We all know Vision Zero is an aspirational goal. . . . It's never going to be a battle that ends as long as there's humans interacting. So the city can't do it alone."